Sunshine and clouds mixed. High 79F. Winds SW at 10 to 15 mph.. Partly cloudy this evening, then becoming cloudy after midnight. Low 52F. Winds SW at 10 to 15 mph. I recall the first time I met him at Hospice du Rhone in Paso Robles in 2015. The crowd around his table was five-deep but I had been told that I had to taste his wines. I patiently waited for an opening and thrust my glass forward. Yves poured some Condrieu in my glass and I was transfixed. Until then, I had never been a fan of viognier, which always built up anticipation with its aromatic nose but then disappointed on the palate with a lack of texture and acidity. Here was a viognier with the apricot, peach and floral notes on the nose that was backed up by the richness and bright acidity on the palate. I was entranced. I met Yves Cuilleron for a second time when I was at Découvertes en Vallée du Rhône early this year. The four-day Rhône Valley wine fair started in the Southern Rhône city of Avignon, moving north to Tain l’Hermitage and ending in Ampuis, the town just north of Condrieu. On my final day, I was unexpectedly invited to join some friends to visit Cuilleron at his winery. I jumped at the chance to go with little expectation of what I was about to experience. The Cuilleron family Domaine was founded in 1920 by Yves Cuilleron’s grandfather, followed by Cuilleron’s uncle who took over in 1960. 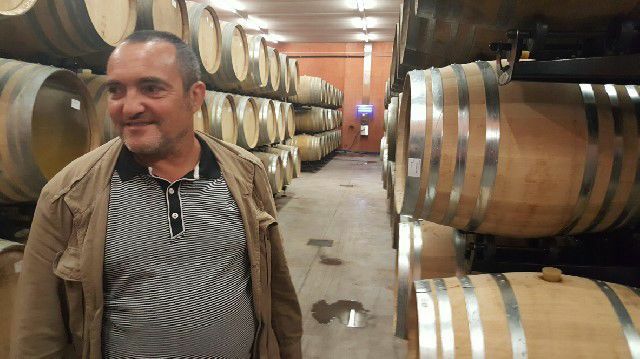 Yves studied mechanical engineering and never thought that he would be winemaker. After completing his studies, he did one year in the army during which his family considered selling the winery. Instead, Cuilleron went to study in Macon, Burgundy at the Ecole Viticole, followed by a year of working in Cornas, before joining his uncle in 1986. In 1987, Cuilleron took over the winery. Thirty years later, he is one of the most revered winemakers in the Rhône Valley, if not beyond. Viognier had almost disappeared in the 1950 but a renaissance has begun in the 1980s, at the same time that Cuilleron began working for the family winery. There were only 14 hectares (35 acres) planted in 1982 and today Condrieu consists of 110 hectares (272 acres). Cuilleron has 12 hectares (30 acres) planted in Condrieu. He also has vineyards in multiple appellations, including Saint Joseph Rouge and Blanc, Cote Rotie and Saint Péray. Producing approximately 50,000 cases of wine each year, Cuilleron had out-grown his old winery. He struggled with limited space and spent years planning his new winery, located in Chavanay, just down the street from his old winery but closer to the river. And it was the new winery that I had the privilege to visit. Cuilleron thought through every element from the moment the grapes are brought in from the vineyards. There are three drop-off points for the arriving grapes – one for white grapes, one for red grapes and a cooler to store grapes that come in at night or if Cuilleron feels they are too warm. Once the grapes arrive, they are loaded into gondolas and attached to tracks that run along the ceiling of the winery. It looks like the clothing track at the dry cleaners except it is transporting grapes. The track will take the grapes to sorting and then the white grapes are taken to the press and the red grapes are taken to the tank for maceration. The pomace is then transferred via the gondola to the press. The winery is 100 percent gravity fed and the presses are very high up so that once the juice has been pressed, it flows right into the tanks and does not have to be pumped into the tanks. With all of the space, Cuilleron was able to build five cellars, each at different temperatures. There are two cellars for white wines, one for single vineyard wines and one for IGP wines. There are three cellars for red wines, one for young wines and two for aging wines. The walkways are also lined with foudre barrels, large wooden vats between 20-120 hectolitres in size for the fruitier-style red wines. Another unique element of the winery is the efficient storage of the red wine barrels, which are placed on base rollers. The rollers are both easier for labor, as barrels do not have to be lifted to be moved, but also result in less evaporation. Cuilleron can control how much oxygen the wine is exposed to by racking the wines a couple of times each year. But during battonage, the wine is not exposed to oxygen as the barrels are rolled in order to stir the lees. In addition, the barrels are stored with the bong on the side. In this position, the bong forms a seal, resulting in less evaporation which means topping of the barrels. The tour of Cuilleron’s new winery ended at the in-house bottling line. Cuilleron is a visionary, both for Condrieu and in the building of his state-of-the-art winery. Cuilleron has built his dream winery and the future of Condrieu is bright.